Finally I posted this look! It had been in my head for weeks. A friend of mine told me I'd look like Lana Del Rey in these pictures. Idk, maybe because of the flower crown? haha, anyway flower headbands are the most perfect accessory. It's a fresh summer look and I love the colors together with the white cross blouse and golden jewelry. The material of the blouse is amazing for summer. It's chiffon and very very light. Studded, colorful dyed shorts are my favorite type of it and I love these ones from Tally Weijl. I also got the pink ones which I already posted a couple of weeks ago. I couldn't be without shorts in summer. This look is definitely perfect for next week's weather - 34°C and more, but unfortunately I can't really enjoy it, because I'll be in school until late afternoon - grr. FINALLY hot weather! It's time for shorts, cut off arm shirts and shorts. I was so happy when I got the package from "Deadendpoet" it's a new scandinavian label and they got amazing designs! Camo pattern has been a trend since fall '12, but in summer I love wearing the pattern as shorts. Oh and flower crowns! My obsession. I got this one from Primark UK, the german stores haven't sold them. And last but not least: My favorite boots, the "Ash Dean" boots. I LOVE them. I constantly wear them. I wore that look last week when the weather had been better than it is now. 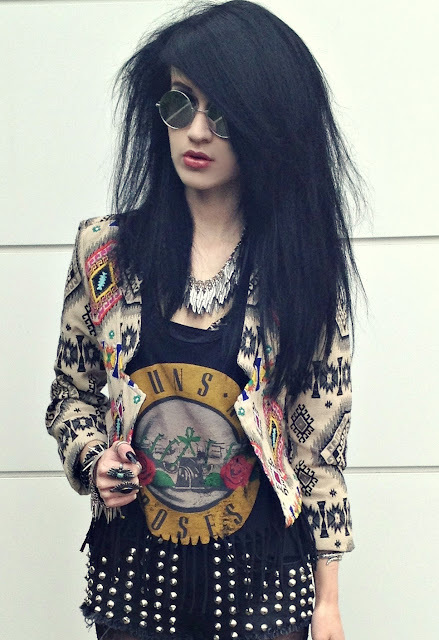 I love the material of the jacket, it keeps you warm in summer and add the perfect boho touch to every outfit. 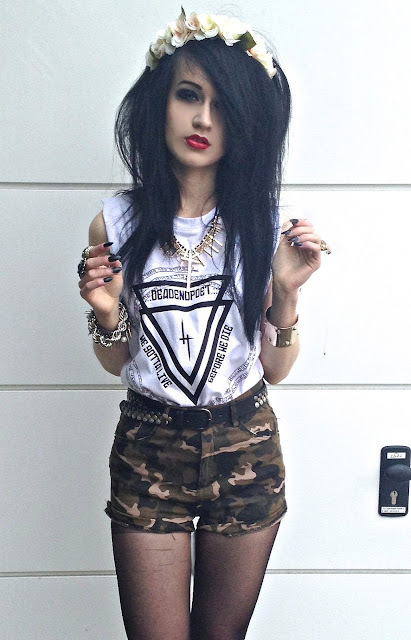 I combined it with one of my favorite band tops and my studded denim shorts from River Island. Not to forget: My new mirrored round sunnies! I'm pretty much into round sunnies as you know and reflective ones go perfectly with jewelry or other details in silver. They are a bit darker than the ones I usually wear though which might be annoying when it's cloudy, but all in all they're awesome and perfect!